Heat oven to 425°F. Remove pie crust from pouch; place flat on work surface. Cut crust in half; place halves on ungreased cookie sheet. Top 1 side of each crust half with half of the roast beef, folding to fit. Top each with steak sauce and cheese. Fold dough over filling; press all outside edges with fork to seal. Cut several slits in top of each to allow steam to escape. Bake 13 to 18 minutes or until crust is deep golden brown. Meanwhile, in 1-quart saucepan, mix gravy and mushrooms. Cook over medium heat, stirring occasionally, until thoroughly heated. 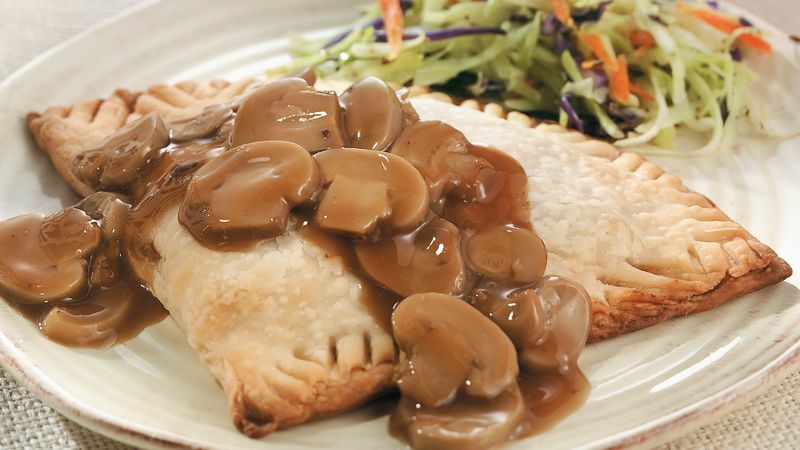 Serve sauce over turnovers.